I am a habitual cyclist. I tend to avoid the adjective 'keen' because, although I do enjoy the practice, my main reasons for cycling relate to convenience, economy and carbon emissions. Cars, which I also use, impact negatively on my enjoyment and it could be argued that any urban cyclist must be keen by definition. But recently, in Britain at least, the increased pedestrianisation of town and city centres has added new hazards. 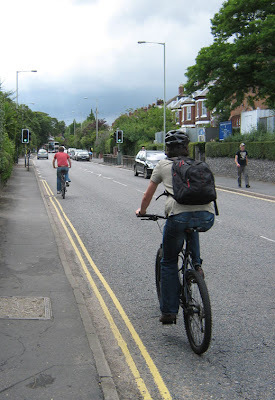 Because we tend to rely heavily on our ears to warn us of danger when crossing roads we don't hear cyclists approaching and this leads to misunderstandings, especially in those streets closed to 'traffic' but open to bicycles. No one likes a pedestrian who just steps out in front of them. And of course no one likes being snuck up on regardless of whether the sneaker is on tiptoe or riding a bike. Introduce silent vehicles the size and weight of cars and these little altercations become far more serious. I read recently (on the BBC) that the Japanese are considering the introduction of noise generators to hybrid cars to make them safer for visually impaired pedestrians. This seems like a very good idea. And not just for the visually impaired. For those of us with a penchant for science fiction films there is a frisson of excitement about this prospect. It's so futuristic. The city soundscape will be awash with tasteful sound effects straight from Blade Runner. No more adolescent joy-riders tearing my ear-drums to shreds. A calm, orderly and sonically restrained future is just around the corner. For where the Japanese are tomorrow, surely we will be the day after. Oh, if only that were the case. Spend any amount of time in a public place and what do you hear? Amongst other things you will hear a succession of ringing telephones. Except that they don't ring, even the ones that pretend to. 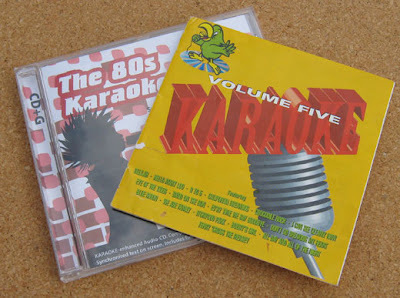 Instead they emit a variety of cheesy 'ring tones' ranging from Roquefort to Dairylea. Now compare the amount of time phones spend ringing to the time cars spend driving. Traffic in a city is a virtual constant and the sounds of the engines are sufficiently similar, and of a range in pitch, that we can screen them out for much of the time. But imagine if all these sounds had been selected by their owners. The vehicular equivalent of the ringtone. Not everyone likes Star Trek. And not everyone wants to drive a black Model T Ford, devoid of furry dice or racing stripes. 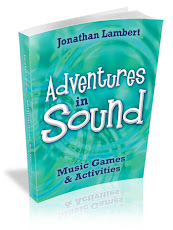 Standardised sounds? For how long, if at all? If you think you hate traffic noise now, you ain't heard nothing yet. Now excuse me while I go and attach playing cards to the spokes of my front wheel. Last night I had to make a snap decision. 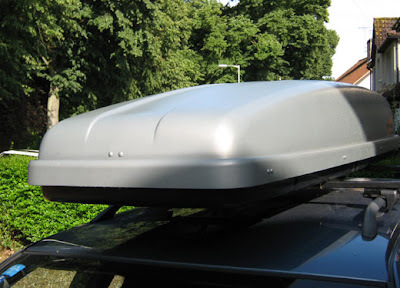 Should I make a 35 mile round trip to look at a second-hand roof box or go with the kids to see some amateur theatre in a nearby park? 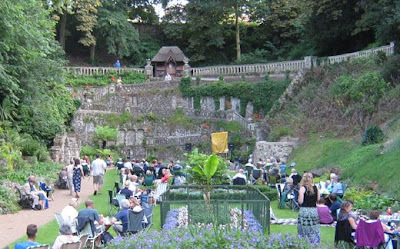 Norwich has a long tradition of Shakespeare in the Park - usually one of the comedies - and I was wondering if I really wanted to sit through another worthy production of As You Like It. Good stuff but heavily reliant on dialogue and in the open air with untrained voices? Well, maybe. But when I asked what was playing I was told it was a piece loosely based on The Beano. That clinched it. For those of you who don't know The Beano is a children's comic founded in 1938. Its stars include Dennis the Menace, Minnie the Minx and, obviously the inspiration here, The Bash Street Kids. So this is why my kids are so keen to go. The penny drops. I was very glad I went. This was the perfect antidote to the performance I bemoaned in my previous post. Not a megaphone or PA in sight. Instead there was an animated cast prepared to project and sing out. Also - oh joy! - there was a live band playing music especially devised for the piece. This comprised trumpet, two saxes, tuba, guitar, banjo and two drummers. They're all there - the camera angle makes is difficult to see the back row. In fact the entire show was refreshingly low-tech. The only electricity involved was the batteries used by a cast member to activate lights on his costume in the second half. Using live music must have presented challenges. The band needs to be close to the stage for communication with the cast and to present the audience with a coherent spectacle. Even indoors, with the actors wearing those little mics that make them all look like extras from ER (fine for sci-fi but very distracting in a period piece), it's hard to get the balance right. But they handled this so well that it only occurred to me later. Walls tend to reinforce instruments and perhaps their absence allowed the sounds to escape. They were facing across the stage whereas the cast directed their songs and dialogue straight at the audience. But great skill and sensitivity were also in evidence: trumpets, drums and saxophones are not naturally quiet. The show was called The Chalk Hill Gang and the company Crude Apache. My daughter is going again tonight. If I wasn't otherwise engaged I would probably join her. 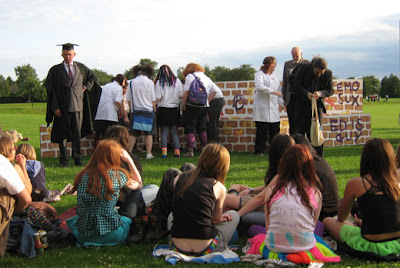 Live, acoustic musical theatre, an original show and all in the open air. It doesn't get much better than this. 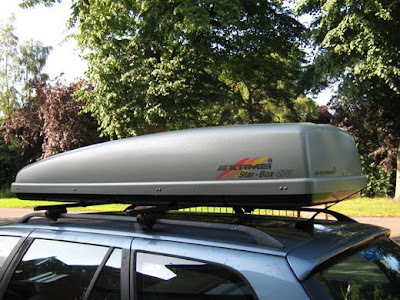 And the world, I have no doubt, is still full of roof boxes. 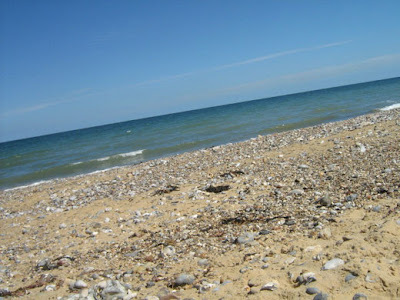 A sunny day and a fine one for the North Norfolk coast. I dropped my partner and the kids near the front and went looking for a parking place. When I reached the cliff top a few minutes later there was no sign of the rest of the family but I did find, between the ice cream van and the lobster traps, a gathering of some thirty souls on a triangle of grass. 'Scripture Union' read the banner but I'd already heard them and their little P.A. system from around the corner. The Billy Graham figure (vicar?) was a mild mannered chap in his 30s with all the iconoclastic zeal of a children's TV presenter from the 1970s. All very English and understated. "So God spoke to you in London," he was saying into a megaphone to a member of the congregation who gave confirmation. "And [to another] God spoke to you at work? What work do you do? A librarian. In which county? Sussex. So God has spoken to us in London and in America and in Sussex. And this is evidence that God..."
Hang on a minute, I think, my heckles rising. Evidence? God forbid you're ever called for jury service. And I find I'm resenting the din of the megaphone as much as the smug self-certainty of the man of faith behind it. But as I wander down the cliff path the tinny music that follows the sermon merges with the sounds of laughing children, gulls and the breeze and I realise this is what the seaside is all about. The world on holiday and all the hullabaloo that goes with it. To me this born-again evangelist is an echo of the showmen and callers of yesteryear. 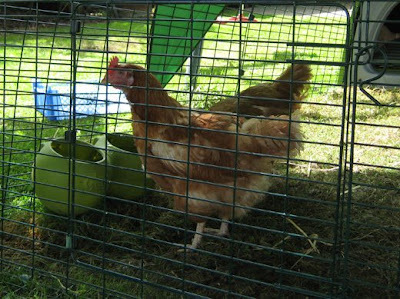 All his flock need to do now is ditch the canned music and form a brass band. That's the kind of revival I'd be game for on a sunny day at the beach. A little tiddly-om-pom-pom along the prom to wake up a sleepy little seaside town and breathe life into what's known here in Norfolk as God's waiting room. Although perhaps I make it seem easy, in fact it is very hard to be critical of performers in school concerts. They are young, they are gaining experience and they are often surprisingly good. If they occasionally have nights they would prefer to forget then they are in very good company. Personally, and with good reason, I am very grateful for an increasing tendency towards forgetfulness. I have railed against school concerts before: overly long and with a tendency to favour student inclusivity over audience sensibility. One thing I didn't mention back in December was the tyranny of technology. In this respect students are often either poorly advised or given insufficient support. Tracks off CDs can go on and on. Your Year 7 girls may have devised a great routine but can it really be stretched to fill the full five minutes of the track they've chosen to dance to? It may be worth explaining to them that what works on TV does so because of the close-ups, cut-aways, expert make-up and special effects. If the music is being performed live this situation does not arise. The music is tailored to fit the routine and not the other way around. I'm not against using pre-recorded tracks per se but with the technology available in most schools, and indeed in most homes, today it should be possible to make an edit to suit the length of the piece. Ditto for singers. Kids do look very cute singing along to 'My Heart Will Go On' but, cheap laugh I know, the song goes on a bit too. And when it's sung thin, flat and through an over-loud PA with a microphone technique impaired by nervousness it can last forever. This is one song that needs to be pruned right back. But things do seem to be improving. I saw an exhibition of street dance at a local secondary school earlier this week. It was short, snappy and high energy with a crisp, exciting edit that left even the non-partisan elements of the audience cheering enthusiastically. I don't know if the track was home made or off-the-shelf. Either way it appears someone has identified a need. It was a rare example of the dog wagging the tail. Let this be the future. For those of us workshopping in the summer break this is a good game for a new and disparate group of varying ages and abilities. It is sufficiently robust to withstand a little anarchy. Just make sure you are holding the loudest, beatiest instrument and lead from the front. Enjoy! I have met people over the years who are only to pleased to impose whatever degree of instrumental talent they may possess on anyone within earshot. They will do this in any place and at any time and although. My own response is always akin to having witnessed them spit in a railway carriage (which used to incur a £25 fine) or fail to clear up after their dog on a public footpath (£100 and climbing). But I realise that many do not share my opinion and actually enjoy the experience, at least for a short while. Secretly I wish I were more thick-skinned. I envy these transgressors their opportunity to practise at any time in any place, even on the most shrill of instruments. Some become very good and, needless to say, uninhibited performers. For my own part I need to be asked to play in public, the request implying permission. Even then I must suppress the knowledge that, whatever the feelings of the majority, someone at least will be wishing I'd just shut up. And that is the person for whom I have most sympathy. As the teaching season draws to a close the opportunities to perform have increased to fill the void. 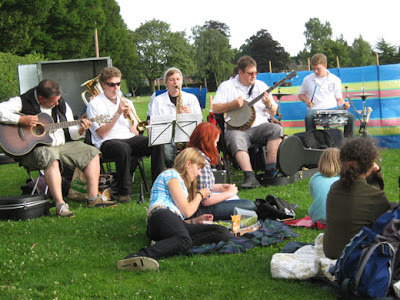 July is a time for village fetes and other outdoor events but the most recent spate of gigs for the Eastern Straynotes kicked off at Blackfriars Hall in Norwich, playing at the graduation ceremony for Norwich University College of the Arts. The building, once part of a mediaeval friary, has a wonderfully flattering acoustic – "like singing in the bath" as one of our number put it. 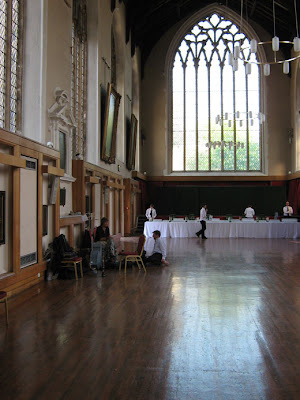 It has wooden flooring, presumably laid on stone, stone walls and a high, steeply pitched wooden roof all contributing to the reverberant sound that survived filling the room with excited, champagne drinking graduates with their friends and families. This was just as well as we had been asked to play without amplification. 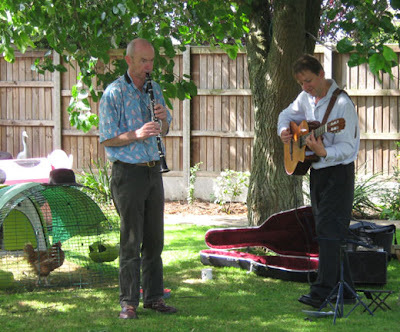 On Saturday, as well as playing at the first fete held by Norwich Steiner School in their new premises, the Straynotes performed in the wonderful Plantation Garden. I have mentioned this in previous postings but, being 'built' in a former quarry it seems to mirror the towering, century old gothic, Roman Catholic cathedral next door. We played at the far end (from the entrance) and again the acoustic was very supportive. A walkway climbs out of the hollow through flint-faced terraces that create a reflective semi-circle behind the 'stage' (a patch of grass on this occasion). A very singular acoustic, only enhanced by birdsong. The other band, a duo called Solto Sueños, comprised Spanish guitar and a woman who sang beautifully in Spanish and the flint backdrop, along with steep sides of the garden, helped her voice carry to good effect. On Sunday we played again at the Sainsbury Centre for the Visual Arts. Another high-ceilinged venue but one in which the sound always seems to disappear into the distance to be lost without trace. In spite of a sensation of playing into cotton wool, that takes some getting used to every time I play there, it is a real privilege to play in such a wonderful building in the presence of so much, and so much variety of, great art from all times and places. So what makes music special? What all these places have in common is a sense of being somehow sacred and of being places in which, I hope anyway, only the incurably gauche would venture to play unbidden. Blackfriars Hall has existed for several centuries and began life as part of a religious community. The Plantation Garden, although one Victorian gentleman's vision and passion, has come to mean a great deal both to those who have helped restore it and to those who visit for the very real peace it brings in the middle of a city. And the Sainsbury Centre, also a place visited for reflection and the calm it retains regardless of school visits or other events, plays hosts to artefacts that have been deeply significant to people in ages past. All these factors have a bearing on the way I play. For me, to be invited to add sound to such places is very special indeed. For all the mistakes I might make performing in these venues, the music sounds far better than a perfect rendition during a rehearsal at home. I have just returned from a week-long camp held annually as a celebration of the midsummer solstice. It takes place in a beautiful meadow full of clover, buttercups and a variety of grasses as well as some wonderful mature trees including oak, beech, hawthorn and pine. There is also a tall conifer I am told is a Wellingtonia. There were about seventy people in total and we camped in three circles, each with a fire pit in the middle for communal cooking and social focus. It was a closed camp (no visitors) increasing the sense of a shared experience. The beautiful setting and perfect weather made for an idyllic few days. A prominent feature of the camp is Five Rhythms dancing. This is a new age dance form devised by Gabrielle Roth. Imagine good old fashioned 'freaking out' (for those of us who danced to prog rock in the 70s) combined with little bits of Chinese five element theory and a smattering of other ideas. Some describe it as a spiritual journey, others as a dance form for people who can't dance. Playing music for it is surprisingly demanding. Each of the five movements can last fifteen minutes or longer, depending on the whim of the teacher. Our ensemble comprised three musicians playing, between them, djembes, balafon, assorted percussion and guitar. I dabbled in most of these, except the guitar, and added clarinet, alto saxophone and both bamboo and orchestral flute. The music was entirely improvised but we agreed on keys and time signatures before hand. 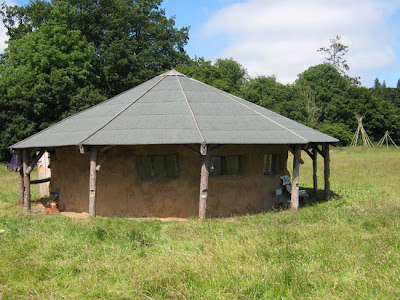 Although the dances took place in a marquee, our rehearsals were held in a mud structure based on an iron age round house which had a wonderfully warm acoustic. Each movement presents its own challenges. The first movement, Flowing, is usually played in 5:4 or 7:4 and this can take some getting used to when playing a melody instrument. The third movement, Chaos, is far more ordered than its name suggests and needs to build to a crescendo. however, building to this over several minutes requires both concentration and strong communication between the musicians. I am pleased to say that we played for a total of five waves (each dance through the five rhythms is called a wave) and played something different each time, even when the teacher sprang a second one on us in the last session. Our three part singing on one rendition of Lyrical (the fourth movement) went down particularly well. 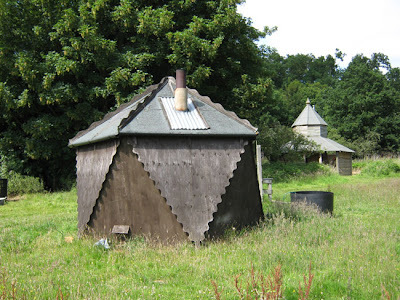 Afterwards the wonderful sauna on the field, built in the shape of an icosahedron, beckoned.